There is something very beautiful about winter whites that I've always loved; an elegance, softness, and grace. And a winter white tea echoes the loveliness of the snow outside, without the chill! I set up my antique gate-leg table in front of my living room window where I could watch the snow swirl outside in the backyard. My grandmother crocheted the runner on this table. The silver spoons are from my mother-in-law. Pots and pots of tea are called for on such a windy, snowy day, don't you think? Bird-watching is a wonderfully restorative occupation, while dunking shortbread or a stroopwafel into steaming hot tea. My bird feeders aren't visible from these windows, but I enjoy our many cardinals, which stand out in stark relief against the barren branches. This creamy white coffee pot (which I usually use for tea), creamer and sugar, and set of six cups and saucers belonged to my Great Aunt Esther. I only saw her a few times in my life, but I do remember the mischievous twinkle in her blue eyes. She lived to be 95, good old New England stock. 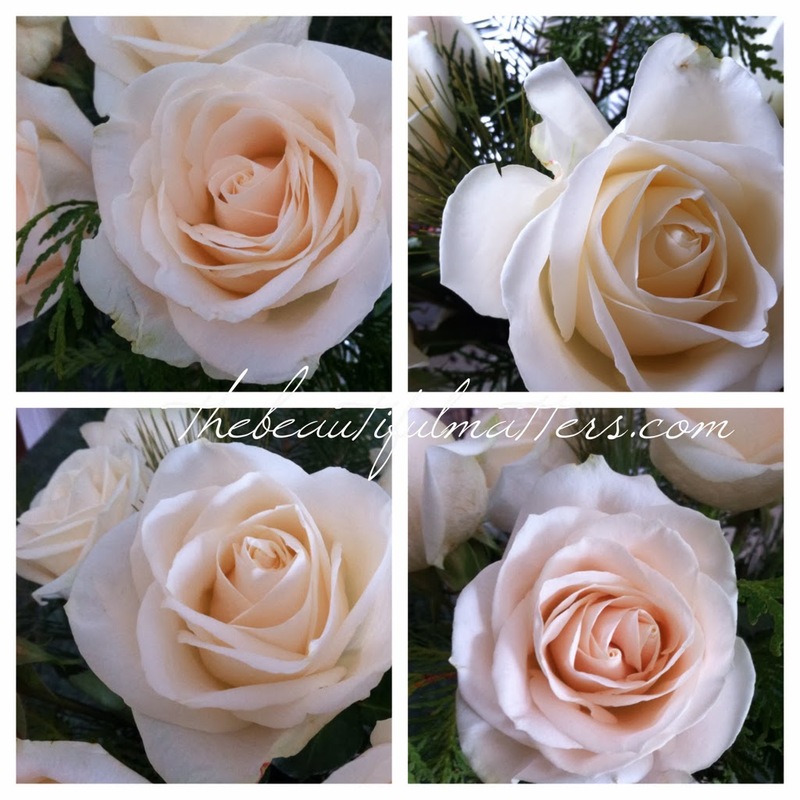 Just can't get enough of white roses. Aren't they beautiful? We are down to single digits again here in Michigan. Stay warm and drink tea! 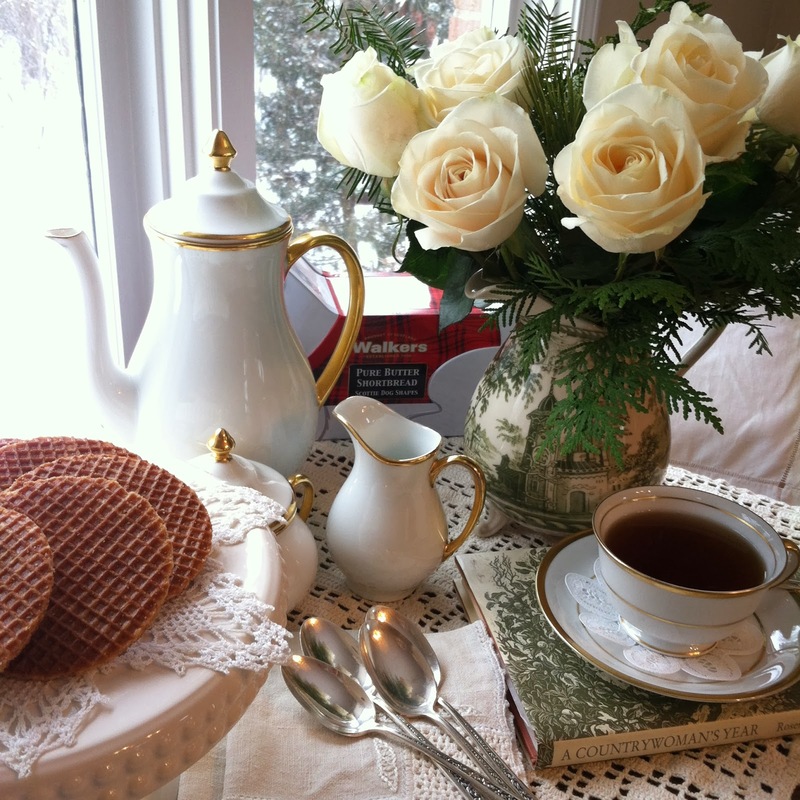 I am joining Sandi at Rose Chintz Cottage sandimyyellowdoor.blogspot.com for Tea Time Tuesday. 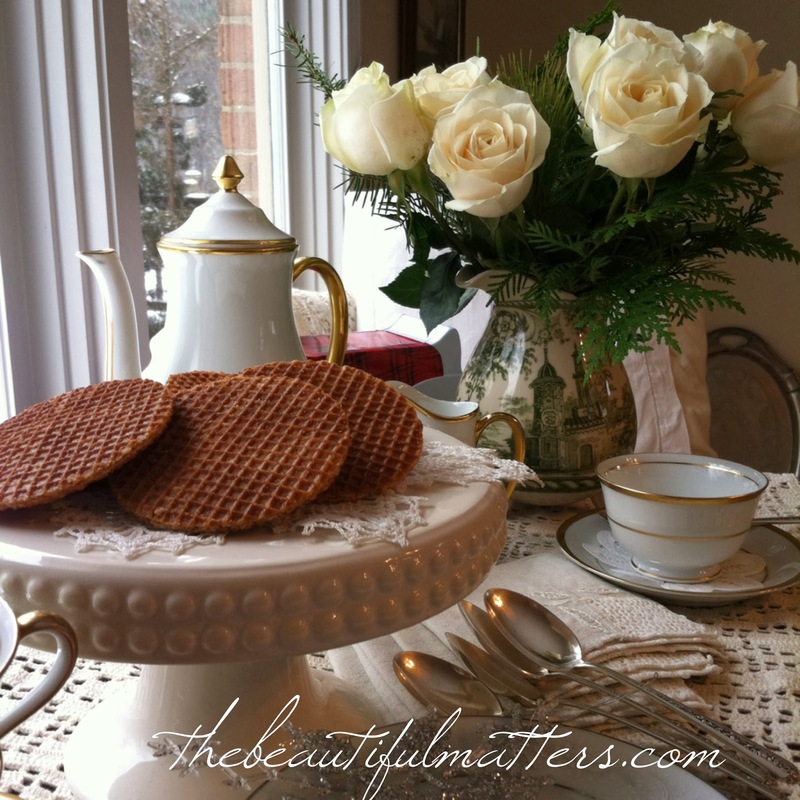 It's her 4th anniversary blog party, so please visit and see all the lovely tea parties she hosts. 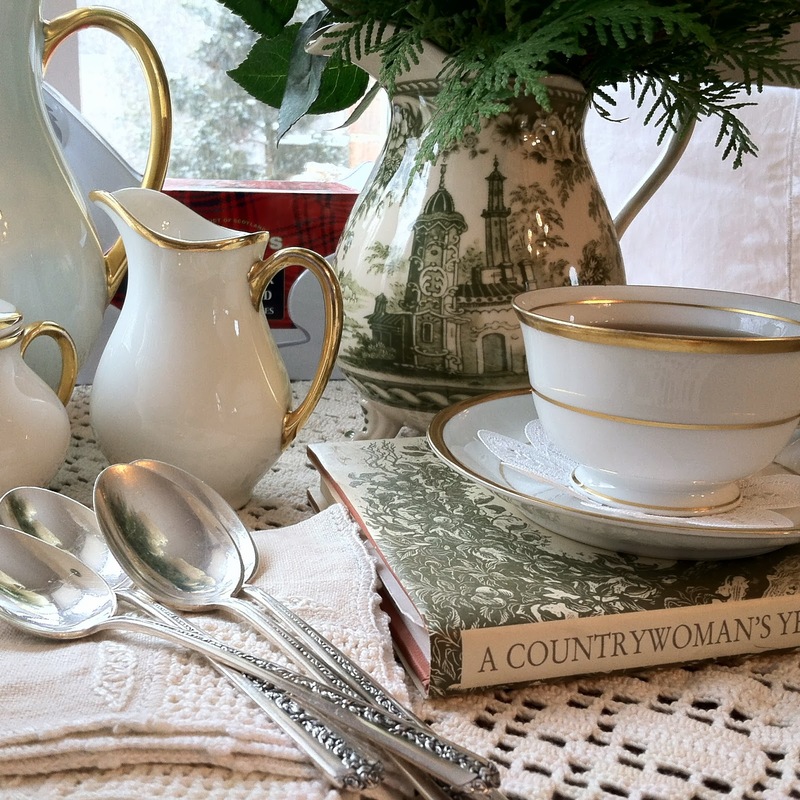 http://www.antiquesandteacups, and Feathered Nest Fridays at French Country Cottage frenchcountrycottage.blogspot.com. What a lovely, romantic tea you've set with your dreamy whites on your treasured crocheted runner. Happy tea day! thanks Kitty, for stopping by. You too! Deborah, your tea setting is simply lovely. I love a winter white tea! The crocheted runner is perfect, as are the silver spoons. I love the pitcher filled with those scrumptious white roses. I do love roses, white and pink ones. I have my bird feeder right outside my front window where I can sit and watch the birdies. They bring me a lot of joy. Thank you so much for sharing your pretties at my tea party. It's a pleasure to have you. thanks Sandi. Seems I've stumbled upon a group of real kindred spirits through your tea parties. So grateful to be a part! Your tea is beautiful! I looked for roses but the selection at our grocery was ehhh.. I named my tea "Winter White Tea" too, we are getting 2 inches of the white stuff tonight. Stay warm! oooh -- I'm popping over to your blog right now! Just lovely! What a gorgeous snowy view you have. Your family treasures are so elegant! And you take gorgeous photos! Thanks so much for your lovely post and linking to Tuesday Cuppa Tea! thank you Ruth. I feel honored to join all you lovely and talented women! Winter whites are a gorgeous addition to a home and I like the vase of roses and your great aunt's china. I could spend several hours by a window sipping tea and watching the birds. me too! and wonder where the time went . . . I visited your blog, but blogger commenting is freezing up on me! don't know why. sigh . . .
thanks Christine. I am blessed to have inherited many beautiful things. Well I think a table by the window watching the snow fall sipping tea sounds divine!! We have yet to have snow this year, I think it will pass us by, so I have enjoyed your very much! The dishes are all so lovely and those white roses... divine! Thanks Bella. Those white roses have been keeping me lovely company for about 5 days now! I love the beautiful snow (when I don't have to drive in it! ), but the cold . . . it's 5 degrees F here! thank you! no matter how many fruits and veggies I consume in watching my weight, any diet that deprives me of an occasional cinnamon roll, pie, or butter, is not for me!! Beautiful teascape. I love white during the winter. It just *fits*! Gorgeous roses. 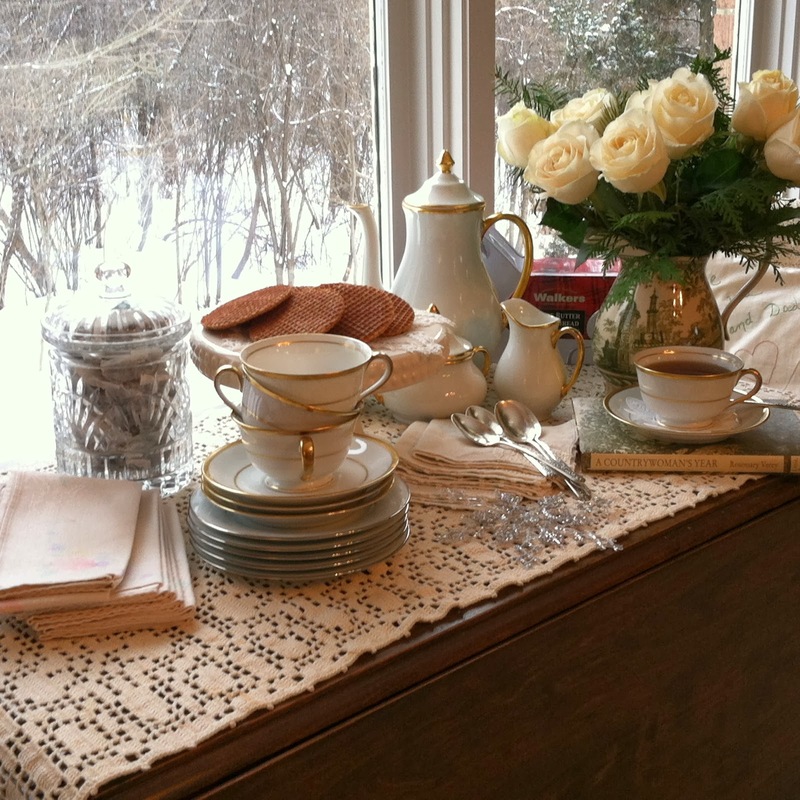 How lucky you are to have the crocheted table runner -- a real treasure .. and the teapot from your Aunt. What stories all this beautiful things could tell! Happy Tea Day! yes, as much as I love all my inherited lovelies, it is the memories that go with them that I treasure the most! Oh this is truly a beautiful post. Such a sweet and welcoming teascape. The setting and china are stunning. Would love to join you for tea. What sweet treasures you have. thank you Janet. I am blessed to have inherited china and silver and linens from both sides of the family. So thankful for all the memories in them. thanks Martha, I appreciate your support of my new blog! You have set an absolutely gorgeous winter tea time - how perfect to help Sandi celebrate in style and grandeur. thank you, Michele, it's wonderful to find so many fellow tea-lovers out there! Wonderful window for bird watching, tea drinking, and dreaming. Every element adds to the whole. It is elegant and cozy. Perfect. I like to think Jeeves would recognize Aunt Bea as a Woman of Excellence. So happy to have found your lovely blog. I'm your newest follower. thank you Susan. I love your comment about Jeeves! I think you're right. There's a peaceful contemplation about January, about winter whites and the stillness of afternoon tea when the outdoors are too cold to beckon anyone. 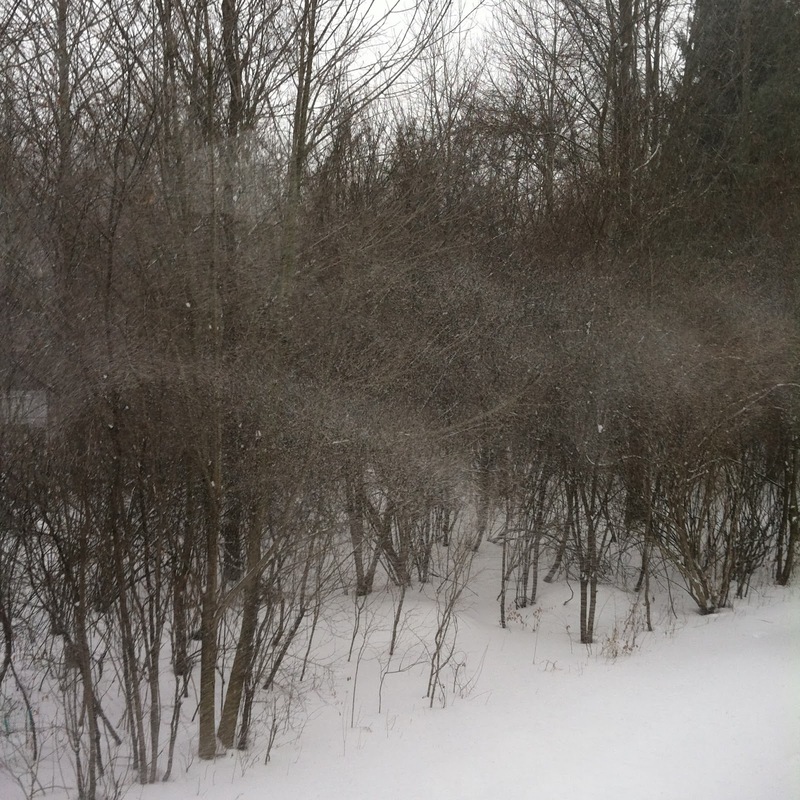 Swirling snow is soothing, in its way. I see that Walker shortbread! So good dunked (quickly!) in hot tea. Yes, my husband loves shortbread. Sometimes I make it for him from his Scottish grandmother's recipe. oh, yay! thank you, Kathy!